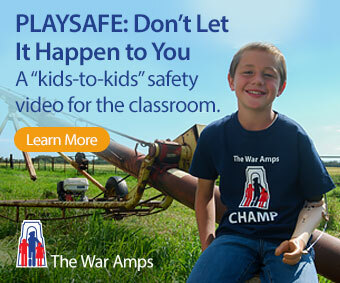 In a time when sedentary and other unhealthy lifestyle choices are so commonly pointed out through various media outlets in our society, it seems to be an important time for us, as educators, to continue being innovative and explorative in order for our elementary school children to develop the skills required for healthy and physically active lifestyles. Although there are several effective ways to help children with this issue in addition to quality physical education programming such as a PHE Fair (Bradford, 2013), this article aims to share some practical ideas related to children’s physical education outside the school walls. As with any subject area, additional work outside school can have several positive benefits such as skill application and enhancement and opportunities for children to share their learning with family members. Although homework continues to play an important role in children’s learning in subjects such as Language Arts and Math, Physical Education homework may not seem so common (and worthy). Therefore, as a current teacher educator (Brent) and a current Grade 5 teacher (Ashleigh), we wish to share a few Physical Education homework ideas in hopes you may find them useful (and worthy) for children’s learning. Physical Education homework holds the potential to meet several curricular outcomes including physical, speaking, writing and math skills, along with several life skills (e.g., cooperation, dedication, determination, goal-setting, motivation, perseverance). 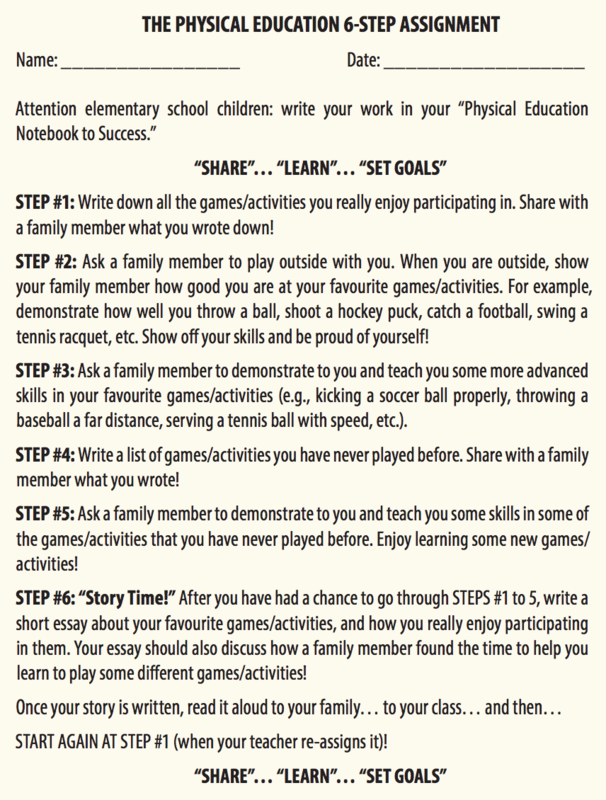 The following three Physical Education homework ideas are intended to be modified, added to, and improved upon so that your students have opportunities to participate in physical activities that they enjoy, want to improve in and/or wish to involve family members in. Enjoy creating checklists, bingo-type games and projects that reflect seasonal changes in your area (e.g., winter activities) and/or special holiday events (e.g., Valentine’s Day). Let the active participation, sharing, learning, goal-setting—and so many more learning opportunities—begin from Physical Education homework! 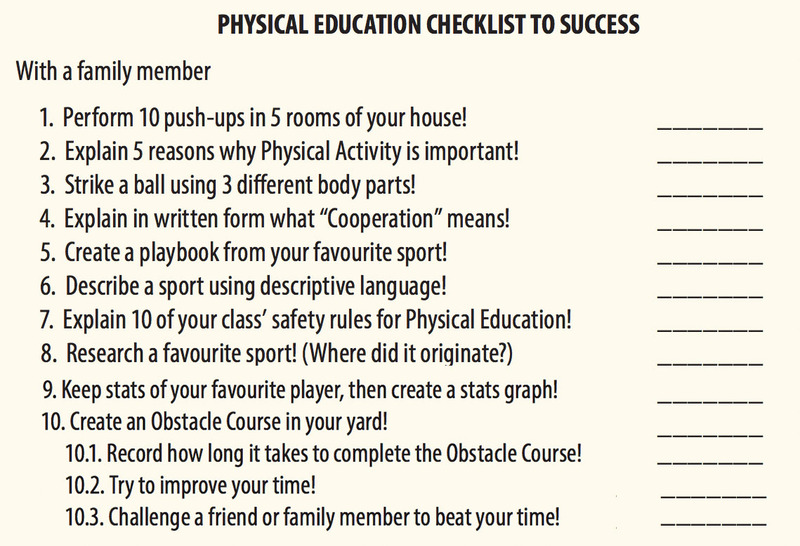 The “Physical Education Checklist to Success” can be as simple as listing a variety of physical activities with different levels of difficulty. Although children could have from one week to a few months to complete the checklist at home (teacher choice), the checklist should include a range of activities and physical skills with a good dose of challenge. 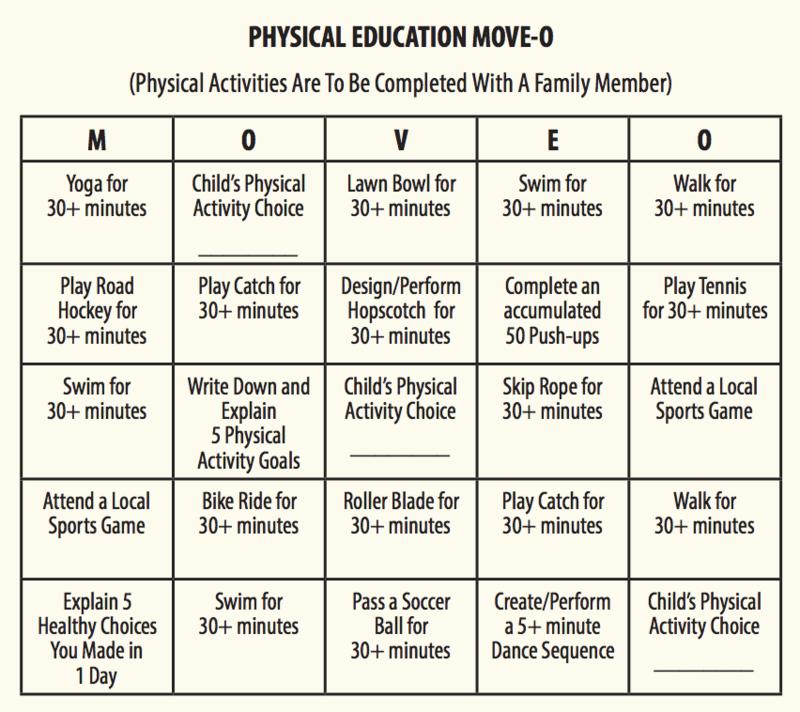 The Physical Education MOVE-O (Bingo type) Card can be an effective way for children and their families to engage in physical activities together. Physical activities that offer breadth and variety are essential for children (and family members) to be exposed to; a sense of enjoyment and challenge should be experienced when filling in the MOVE-O Card. As an example, children and their teachers could research local fitness centres for family classes, drop-in classes, free community activities and areas (e.g., playgrounds, tennis courts, baseball parks, etc.) for inclusion on the MOVE-O Card. Once the MOVE-O Card is designed, children can take it home to begin the process of filling it in completely. As another approach to providing Physical Education homework opportunities for children, we would like to share a strategy that could be extended over a longer period of time. As with the previous two examples, the objective behind the “6-Step” assignment is to help develop a sense of cooperation between children and their families en route to developing enhanced levels of self-efficacy, knowledge, attitudes and skills required to live healthy and physically active lifestyles. As you read through the sample Physical Education Checklist to Success, MOVE-O Card and the 6-Step assignment, you probably noticed (and came up with) a wide range of ideas that could be included for your specific students’ learning needs. When creating Physical Education homework, strive to remember the importance of offering them challenges, breadth and variety while also promoting a sense of enjoyment for them to experience! Providing children with opportunities to engage in Physical Education homework can result in so much more than enhanced skill levels required to participate successfully in Physical Education. The following is a short list of subject integration possibilities related to Physical Education homework. As you read through the list of possibilities, it is hoped that you come up with some additional ones and share them with your colleagues! An important part of a child’s school year is learning at home. Homework is as common as having children sit in their desks at school. However, there are subject areas that receive much more attention than others during homework time. With what is known about the positive effects of healthy and physically active lifestyles, we believe Physical Education homework will play a primary role in the overall development of children. Each and every day, we can read a journal, a newspaper, and hear on the radio that when children live healthy and physically active lifestyles, they perform better in school. This point should not go unnoticed. As educators, let’s send home some Physical Education homework assignments this year and observe how children are impacted. We believe it will benefit them and their family members greatly! Bradford, B. (2013). Physical and Health Education Fair: An Effective Learning Opportunity for School Communities! Canadian Teacher Magazine. (Issue: May/June 2013). Brent D. Bradford (M.Ed.) has taught at both the Elementary and Junior High school levels. After a decade of being a school teacher, he returned to the University of Alberta to pursue graduate work and to teach higher education. He is currently working towards a Doctor of Philosophy Degree. While doing so, Brent teaches curriculum methods courses as a Teacher Educator. In 2011, he was recognized as an award-winning Teacher Educator at the University of Alberta. Ashleigh K. Evaniew (M.Ed.) currently teaches Grade 5 with Edmonton Public Schools. Ashleigh earned a Master of Education Degree from the University of Alberta. During the time she was enrolled in graduate school, she taught curriculum methods courses as a Teacher Educator in addition to teaching elementary school. In 2012, Ashleigh was recognized as an award-winning Teacher Educator at the University of Alberta.